Gideon's Band was the name of a secret political order that purportedly operated in North Carolina between 1892 and 1894. The group, which was said to have only a few hundred adherents, was believed to be headed by S. Otho Wilson, a Wake County member of the Farmers' Alliance and Populist Party leader. There is some debate over whether Gideon's Band actually existed or whether it was simply a fabrication of the Democratic Party. Most of the persons who argued that the organization was real were strong Democrats, including Furnifold M. Simmons, chairman of the Democratic Executive Committee; Samuel A. Ashe, editor of the Raleigh News and Observer; and Josephus Daniels, soon-to-be editor of the News and Observer. In the final analysis, no evidence of the group's actual operation has ever been found. Nonetheless, the persistent rumors about Gideon's Band did somewhat tarnish the image of the Populist Party, especially in the campaign of 1892. Simmons, desperate to combat the expected defections to the Populists, obtained letters in October 1892 from persons proclaiming the existence of "an unlawful and dangerous political society" led by Wilson. Simmons intimated that the third-party movement, which had constituted such a mystery to loyal Democrats, was thus explained. Eventually three men gave testimony about the mysterious order. Ashe called for Wilson's prosecution under a state law that prohibited secret political societies. 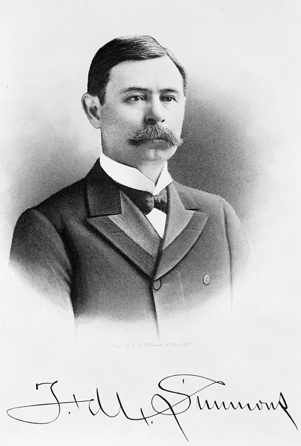 Solicitor Edward W. Pou prosecuted in early 1893. In March, on the advice of attorneys, Wilson pleaded no contest, which the Democrats interpreted as an admission of guilt. The disgruntled Populist attempted to have the plea withdrawn, but the judge would not allow a reversal. Wilson was widely ridiculed in the press over this affair. Josephus Daniels, Tar Heel Editor (1939). Lala Carr Steelman, The North Carolina Farmers' Alliance: A Political History, 1887-1893 (1985). Raleigh, N.C.: Barnes Bros. 1893. Butler, Marion, and Cyrus Thompson. Addresses of Marion Butler, President, and Cyrus Thompson, Lecturer, to the North Carolina Farmers' State Alliance, at Greensboro, N.C., Aug. 8, 9, and 10, 1893, at its Seventh Annual Session. http://docsouth.unc.edu/nc/butler93/butler93.html#butler7. Engraving of Furnifold M. Simmons with facsimile autograph, by E.G. Williams and Bro., New York. Image from the State Archives of North Carolina. Call number N_53_15_644.